NASA is seriously upping its emphasis on small satellite constellations in the coming months. The first Earth science project to come out of all that is CYGNSS (pronounced “sig-nuss”), which is an acronym for the Cyclone Global Navigation Satellite System. It’s a system of eight small satellites and they might just save your life one day. CYGNSS is a constellation of eight small satellites that will be flying in formation to take a hard look at how hurricanes intensify. Ultimately, the mission could help determine the point at which people need to evacuate. On Monday, NASA scientists outlined the mission, slated to last at least two years. CYGNSS will launch on December 12 from Cape Canaveral, Florida. One of eight microsatellites in the CYGNSS constellation while under construction. The mission will collect data to improve hurricane intensity forecasts. When Ridley and his colleagues looked at the historical tracks of hurricanes and tropical cyclones over the last 10 years, they found that the majority fell between plus and minus 35 degrees in latitude. CYGNSS is accordingly positioned to fly in that range. 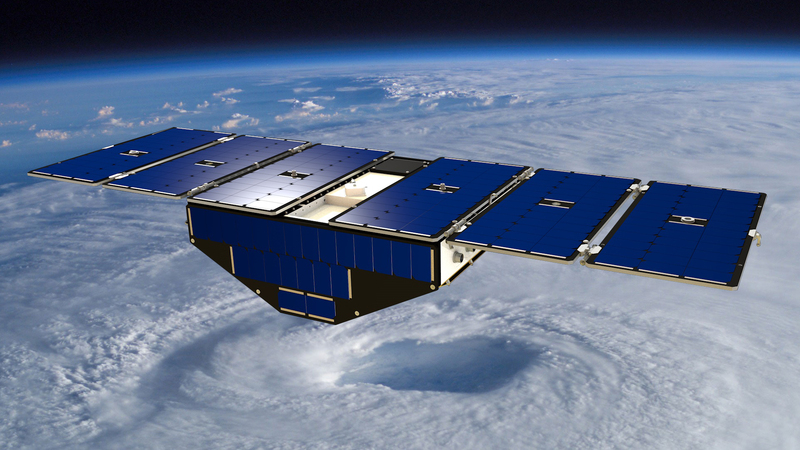 Artist's concept of one of the eight Cyclone Global Navigation Satellite System satellites deployed in space above a hurricane. Here’s how CYGNSS works: It measures a reflected GPS signal off the ocean’s surface — the eight sats will essentially bounce signals off the ocean, and from the strength with which they’re reflected back to the satellites, we can determine the strength of the wind. No wind would mean a strong signal; a high, dangerous wind would mean a rougher ocean surface, and a weaker, more scattered signal reflected back. This allows the scientists to determine wind speed by using taxpayer-funded GPS satellites, a feat at which all the larger satellites that came before them failed. CYGNSS will lead to vastly improved weather-forecasting models, meaning we’ll have a better idea of both the direction and intensity a hurricane will take before it makes landfall. This, in turn, means an earlier-warning system, and hopefully a reduction in unprotected infrastructure and loss of life. CYGNSS could still meet its objective — to effectively measure about 70 percent of the tropical region — with as few as five of the eight satellites if any malfunction. This is the advantage of small sat constellations: They’re low-mass and relatively easy to put into orbit, and the data isn’t compromised if something goes wrong with any one instrument. The total cost of the mission is a relatively low $150 million, with $100 million allocated for the satellites themselves, plus various scientific expenses, and the remaining $50 million for the launch vehicle that will get them where they need to be.